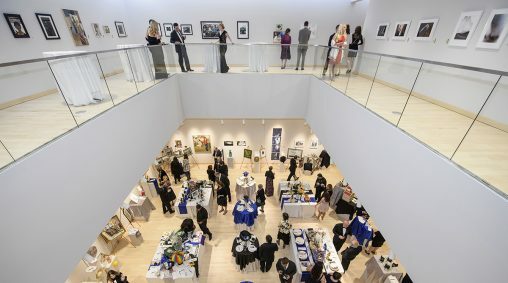 ArtsGala, which showcases all the fine and performing arts at Wright State University in one place and time, celebrates its 20th year on April 13 with an incredible evening packed with student performances, fine dining and memories. Presented by the College of Liberal Arts, ArtsGala is a magical evening where art is happening all around — theatre, dance, music, visual arts and motion pictures. It is regarded as one of the area’s premier arts events, drawing over 800 patrons each year. The first ArtsGala in 2000 was the brainchild of Mary Ellen Mazey, former dean of the College of Liberal Arts, who attended arts events and performances in the Dayton area, but always left wanting something more. “I kept thinking we have such great arts programs at Wright State, why don’t we showcase those because we can offer something better,” she said. 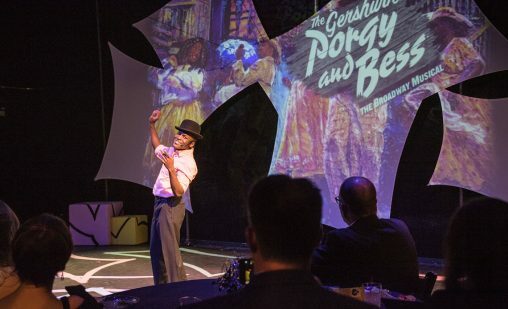 Mazey wanted to make the community aware of the incredible talent of Wright State’s fine and performing arts students, while raising needed scholarship money. She spearheaded the inaugural event with support from former Wright State President Kim Goldenberg, an internal planning committee, external host committee, volunteers and community sponsors. About 350 attended that first year. Since 2000, ArtsGala has raised more than $2.7 million, which has resulted in 765 student scholarships in the fine and performing arts. Nearly $200,000 was raised at last year’s event. Dancers delight audiences at ArtsGala. “I want to become an actor, and I don’t know if I would be able to do that without the ArtsGala scholarship,” said Mark Antony Howard, a sophomore acting major. Howard is delighted to perform for ArtsGala patrons as his way of saying thank you. In honor of the 20th year, ArtsGala has taken the fundraising opportunities a step further by introducing the ArtsGala Society to significantly increase scholarship support for students. The society package, developed by one of the original founders, 1977 alumnus Larry Klaben, will include tickets to ArtsGala 2019, name recognition in the program and an opportunity to meet the recipients of ArtsGala scholarship support. “I think the most fun for members of the community is that they not only see the talent of our students but then they get to talk with them and hear about their hopes and dreams,” said Linda Caron, current dean of the College of Liberal Arts. Approximately 400 Wright State students participate in ArtsGala as either performers or volunteers. “Students are in awe that people that they don’t even know care about their future and care about their success,” added Caron, who also has been involved since the first ArtsGala. Those attending ArtsGala enter the Commons of the state-of-the-art Creative Arts Center and move from one themed dining room to another. They are treated to an aria in one space, jazz in another, or rock ’n’ roll down the hall. Plus, they will enjoy many styles of dance throughout the evening. In the Stein Galleries, attendees may talk with student artists as they paint or sculpt. Watch Buckwalter’s interview on WRGT. View the ArtsGala TV commercial. In the last several years, many generous sponsors have supported the event, including Morris Furniture Company and Wright State’s Barnes & Noble Bookstore, both serving as presenting sponsors for many years. Other major sponsors include Dayton Business Journal, Emerson, Heapy Engineering, HORAN, Zoe Dell Nutter, Prime Time Party Rental, ThinkTV, WHIO-TV and Wright State University Hospitality Services provided by Chartwells. ArtsGala also would not be possible without the generous support of hundreds of volunteers, supporters and sponsors. Many businesses and individuals have partnered with ArtsGala for years, having recognized the tremendous value of this partnership — for themselves, their businesses, and students. ArtsGala runs from 6 p.m. to midnight in the Creative Arts Center on campus. Tickets ($250 each) and information are available at wright.edu/artsgala or 937-775-2233.